The record is made up of Codex A collection of pages, usually gathered into quires, and bound between covers. ; ff. ii+250+i. It was created in Dhū al-ḥijjah 1134. It was written in Arabic, Persian and Farsi. The original is part of the British Library: Oriental Manuscripts. 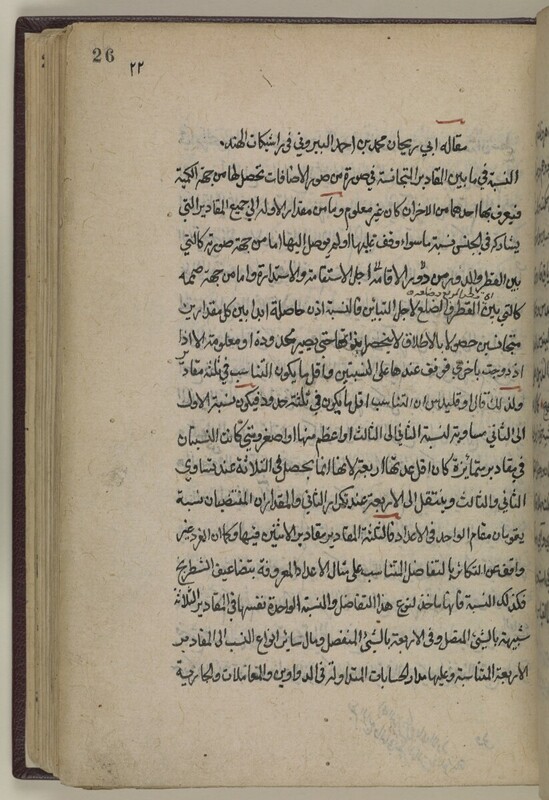 Compendium of short texts, extracts and notes on scientific and philosophical subjects, compiled by Aḥmad ibn Sulaymān Ghūjārātī (أحمد بن سليمان غوجاراتي; d. 1681), and completed in Dhū al-ḥijjah 1134/September-October 1722 (see note on f. 5r). The manuscript was later owned by the compiler's grandson, Muḥammad Riḍā ibn Ghulām Muḥammad ibn Aḥmad ibn Sulaymān (محمد رضا ابن غلام محمد بن أحمد بن سليمان), at Surat, who added ten lines of verse on 18 Ramaḍān 1141/17 April 1729 (see f. 250v, lines 11-14). (25) Ten lines of verse by Muḥammad Riḍā ibn Ghulām Muḥammad ibn Aḥmad ibn Sulaymān (محمد رضا ابن غلام محمد بن أحمد بن سليمان) [Arabic] (f. 250v).